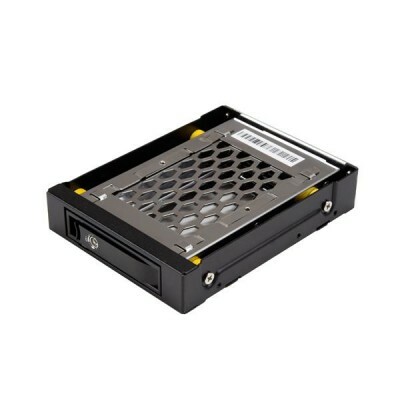 Increase the storage capabilities of your server or PC while protecting your data, with this 2.5â€ SATA drive hot-swap bay. Turn the 3.5â€ front bay on your desktop computer or server into a hot-swap bay for 2.5" SATA SSD/HDD drives. Ideal for IT professionals, such as system administrators or computer operators, this mobile rack lets you quickly swap, replace, remove, or transport a drive between systems or locations. It saves valuable time in environments where storage drives need to be replaced or removed regularly, such as in server rooms and data centers. To maximize the speed and performance of your drives, the mobile rack supports SATA I, II and III, providing data transfer speeds up to 6Gbps when paired with a compatible controller. The SATBP125VP is backed by a StarTech.com 2-year warranty and free lifetime technical support.